One of my favorite things to do is rearrange furniture. The hard part is trying to figure out the least amount of moves to get the look I'm going for. And sometimes I just don't know until I see it. I've been struggling with how to arrange our back room. It's a good size room, plenty of space but it has some jobs that aren't so pretty. Currently, it's a mud room and covered in salt from the snow the last couple of days and we've moved the dog's night quarters into the space so that she doesn't have to fight the stairs every night. It's often covered in shoes oh and my desk in there because I can't figure out any other place I can put it and use it. So yeah, stuff, lots of stuff. And that doesn't even include the things waiting to be donated and the go back out to the garage. Today I remembered this handy little tool that's in the picture above. It's a scale ruler and it's used to... scale things. Each side is an exact scale amount to the others 10, 20, 30, 40, 50, 60. So depending on how big my drawing space is, I can make a replica of my room's measurements and small rectangles and squares to represent the things I want to move around in there. I really like the fact that once I have the scale, I can use it to put any piece of furniture in the room to see if I like the idea of it in the space. 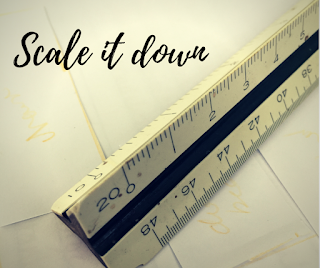 This tool is especially helpful if you're moving or wanting to buy a new piece of furniture or area rug because you can get a real idea of the scale compared to everything you have in there already. And it's so much easier to move pieces of paper around a gazillion times than actual furniture. I think I have the space worked out, but I'm going to rest on it for a while to see. What tools do you use for rearranging your house?